Sani Tourist House is a small bed and breakfast in the heart of Florence. Well-equipped rooms make for a home-like stay in this third-floor apartment close to where Dante once lived. I stayed at Sani Tourist House anonymously for two nights in April 2005, having booked my single room online. Prices vary, but I was charged exactly what I expected (note that you pay the day before check-out as the host may not be around when you leave; and credit cards aren't accepted). The bad news on arrival is that instead of a fully ensuite room, as expected, I have an external toilet (it's a few steps down the corridor, and is private; I have the key). However, this is rapidly outweighed by the good surprises: the autonomous heating (wonderful!) and spare blankets. It's an unusually cold April, and the hotels I've been staying in have been uncomfortably cold, so this is an unexpected bonus. In every way, this bed and breakfast offers a lot more than I expected from moderately-priced accommodation. My single room is not very large, but it's a comfortable size, and an impressive array of features have been fitted cleverly into the space: a TV (high up on wall-mount); desk and chair; wide single bed; hairdryer; air-conditioning (upon request, extra charge); radiator; fridge; safe; Wardrobe; storage space. There is a washbasin, towel rail, mirror etc. in the bedroom, and a shower opening off it. There are pictures on the wall and the decor, though not special, is perfectly decent. 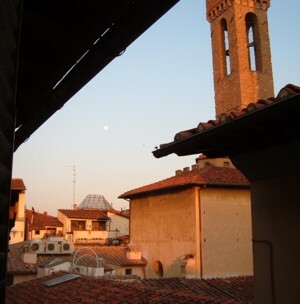 From my window I can look down into a narrow medieval lane, or admire views over Florentine rooftops to towers. On arrival I am greeted by the owner, Remo. He is helpful, speaks good English and takes the time to make me at home, show me the room's facilities, direct me to shops etc. As expected from the reviews I'd read (though it still feels odd if you're used to hotels), there was generally no host/help on hand out of hours. Need to know info: someone will be around in the afternoon and early evening (see details on the B&B's webpages), otherwise you should ring for arrangements. Take the address, map and phone number. When there you'll have your own keys and let yourself in and out (the lock on the door to the flat was a bit tricky but there's a knack to it). Sani Tourist House has a very good location in the heart of medieval Florence (but check the map provided as the Piazza isn't on most tourist maps). The B&B is situated a few streets south of the Duomo in a little piazza between Via del Corso and Via Dante Alighieri (close to Dante's house and Santa Margherita de Cerchi). Breakfast is taken at a cafe-bar down the street - a classy establishment with good fresh bread and pastries, making it a cut above the usual hotel fare. I also find it convenient that I'm not restricted to set breakfast hours - I can wake up, enjoy some fruit juice from my fridge, head off to a museum or two before the other tourists arrive, then enjoy my tea and pastries at a time that suits me. Very soon I feel at home and it's exciting to have a base right in the heart of medieval Florence. I'm excited as I trip down the street to stock up on provisions for my fridge. And I can't help feeling a bit smug as I return with my shopping bag, slotting my key into the building's front door while a group of German tourists gaze at the facade, being lectured by their guide. The external toilet isn't a particularly inconvenient arrangement. The shower is adequate, although a bathmat might be useful to stop me splashing the bedroom floor. The accommodation is pretty quiet (thanks in part to the other guests), and I sleep well. As an afternote, I mislaid a small but important item in the room here when I left. I emailed Remo from Rome and he was kind enough to send it by recorded delivery to my UK address. Although there are also some very comfortable hotels in Florence, I would still choose to return to this B&B. 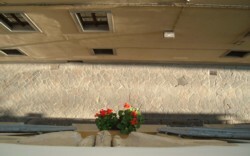 It was comfortable, affordable and convenient, and no hotel could beat the great feeling of returning along the historic lanes to my own little Florentine pad. B&B address: Piazza dei Giuochi, 1. The B&B is an apartment on the third floor (there is a lift). Although the distance is walkable, the easiest way to arrive from the station with suitcases is to take bus A, which passes within a few streets of the B&B. Once installed, you'll find it easy to walk to all of Florence's tourist sights. Sani Tourist House B&B review by an Italy Heaven editor.